A dozen pharmacists throughout Zambia recently completed their Master of Pharmaceutical Public Health course with JCU, despite intermittent Internet access and other infrastructure issues – not to mention the weather. “At the time, they were going through quite a severe drought and as much of the power in Zambia is hydro-electricity, they had a lot of power outages,” said Associate Professor, Pharmacy, Ian Heslop, who visited the country twice to deliver ‘intensives’ (face-to-face teaching) to students during the two-year course. 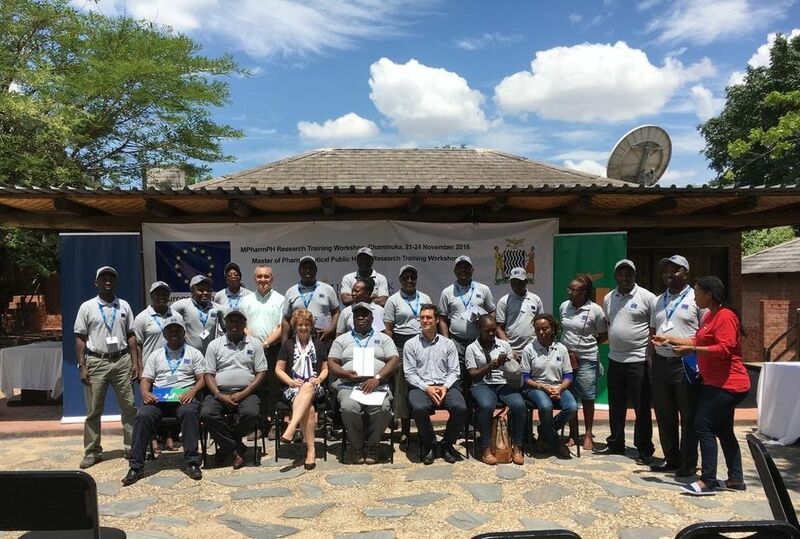 The Masters course for the Zambian pharmacists, who hold senior positions in their country’s health system, was funded by the European Union (EU), as part of their multi-million dollar Health Systems Strengthening Project (HSSP) in Zambia. “One of the main aims of the HSSP is to strengthen the supply chain for medicines around the country, so that medicines get from the central warehouses in Lusaka out to all the individual clinics in remote areas,” Dr Heslop said. JCU Adjunct Associate Professor Murray Bailey, who helped to develop the Master of Pharmaceutical Public Health program and now works as a contractor with agencies like the United Nations and EU, first floated the idea of Zambian participation in the Masters course with the country’s chief pharmacist several years ago, according to Dr Heslop. The initiative was included in the HSSP funding proposal and subsequently given the nod by the EU. Dr Heslop and JCU colleague Professor Beverley Glass visited the Zambian capital, Lusaka, on a fact finding mission in late 2015, before the students commenced study in 2016. “We wanted to find out how the health system works, so we could tailor some of the course subjects to better meet their needs,” he said. Zambia’s infrastructure problems had a direct impact on how the JCU course was delivered to the students. “We had to be careful how we gave resources to the students, because if we had a really fancy online model, students in some remote areas wouldn’t have been able to access it, because the Internet wasn’t good enough. So we used a combination of book-type, physical resources, as well as some online resources. JCU teaching staff trekked to Zambia to deliver ‘intensives’ to the students at two key points in the course, in November 2016 and July 2017. On each occasion, they spent four to five days with the students at a teaching venue near Lusaka. The students covered a range of subjects, including pharmacovigilance (PV), and pharmaceutical quality and regulation. “Pharmacovigilance is about the post-marketing surveillance and monitoring of medication problems,” Dr Heslop said. Pharmaceutical officer in charge of Zambia’s North Western Province, Catherine Chidumayo, said the Master’s course had equipped her with valuable research skills. Dr Heslop believes that he and the other JCU staff involved in delivering the course had also learned a lot from the experience. Dr Heslop is about to head to Lusaka again – to present the 12 students with their certificates at a special graduation ceremony on 12 June 2018.